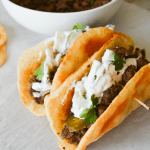 This Low Carb Flatbread (Spiced Beef with Tzatziki Sauce) is a mouthwatering Greek-inspired dish that’s filling and easy to make. It’s a great blend of spice, and a perfect keto lunch! You may want to bake flatbread first so it has time to bake and cool while you prepare the ground beef and sauce. Preheat oven to 350 degrees. Line large baking sheet with parchment and set aside. In large bowl, place mozzarella and almond flour. Break cream cheese into small pieces and place into bowl. Microwave bowl for 1 minute, or until all ingredients are melted and easily mixed. Using spoon or rubber spatula, mix ingredients until ball forms. Wet hands with a bit of water and pick up dough ball. Form it until smooth and all ingredients are fully combined. Use a knife to cut dough ball into 4 even sections. Re-wetting hands when necessary (prevents sticking) press each dough ball out into flat circle, about 5-6 inches in diameter. You may do this in hands or on baking sheet, whichever is easier. Bake for 12-14 minutes or until flatbread begins to turn golden brown. They may puff up a bit, that’s ok. If your dough is too stiff or will not spread, it may be too cold. Place it back in the microwave for 5-10 seconds and it should be easier to spread. Brown ground beef in skillet over medium heat. When no pink remains, drain grease. Add onion, jalapenos, ginger, cumin, cloves and water. Bring to quick boil then simmer for about 10 minutes until most of water has evaporated from pan and onions are soft. Turn off heat and add cilantro. In large bowl, place sour cream, cumin, dill, lemon juice, salt, and pepper. Whisk together until smooth. Add cucumber to bowl and fold in until fully covered with sauce. Place 1/4 of beef mixture on flatbread and top with 1/4 of sauce mixture. Fold and garnish with additional jalapeno and cilantro,if desired. I didn’t weigh this recipe for nutritional purposes. If you need more accurate serving information, place beef and sauce separately on food scale to get weight in grams. Divide weight by 4 and that will give you the grams per serving. For less carbs, omit flat bread and replace with cauliflower rice. Some of these carbs are from the seasoning. There’s no egg in this flatbread, you don’t need it and doing so may make the dough overly wet.